On March 31, Newfoundland and Labrador marked the 70th anniversary of joining Canada. Writer Edward Riche gets inside the psyche of the youngest province now living the senior life. You have to go to the doctor more often than you’d like to now. You went to see her about Burnt Head. But she says that it was nothing to worry about, and the good news is that you’re Heart’s Content. She thinks your latitude is a little high for someone your age. You know it - you really feel the damp and cold these days, your isthmuses ache and you think you might be developing Bull Arm. No wonder. You have worked long and hard: in the fishery for a time, as a nurse on the South Coast, in St. John’s chained to a desk, and with the cousin, Alberta, for a patch. The doctor is on about your diet. Admit it; you weren’t completely honest about the quantity of salt meat you are still eating. Or salt pork or salt fish. You are going to have to watch the salt. You were skin and bones before Confederation, half starved on the dole during Commission of Government. Have to admit you are a little big now. You’re going to have to limit Mary Brown’s to special occasions. But 70 years old or not, there is no way you are denying yourself a fi and chi with dr and gr from Leo’s when you are in town on business. What would be the point of living? You never go on a tear like you used to (there was many a time! ); you can’t take the punishment the next morning and you don’t sleep well at the best of times. But you still enjoy the occasional nip and cannot resist singing songs long into the night. For whatever reason, the one thing you never forget, even as you get more forgetful, are the words to all the old tunes. The younger crowd are always impressed when you belt out the “When blinding storm gusts fret thy shore / And wild waves lash thy strand / Thro’ spindrift swirl and tempest roar” verse of the Ode, or sing to them that “Jim Brine, Din Ryan, Flipper Smith and Caroline” were also at The Kelligrews Soiree. In a moment of youthful exuberance, you did the Upper Churchill project and overlooked some of the contractual details; never thought of the long-term consequences. But in 1969 you were just 20, and what 20-year-old thinks about their future? The Sprung Greenhouse, that was a mid-life crisis; you see that now. You were flush with oil money, so you spent too much on Muskrat Falls. Live and learn. Couples like Newfoundland and Labrador always have their troubles, but you’ve managed to work through them. There’s been the occasional row, but you each have to admit that there is no one who would understand either of you better than the other. Face it: you are both a little weird. And what a brood you two produced! Hundreds and hundreds of thousands of them, most of them gone off on their own now. Cousin Ontario needed the extra hands and imagination, so you didn’t try to stop the youngsters from going upalong to lend assistance. Your kids have done well there. That’s the problem with having children: you raise them to be interesting, independent people, capable of fending for themselves, and they go off and have their own interesting lives. And the grandchildren, alas, they are more Canadians than Newfoundlanders. That’s the way it goes. The place seems so big and empty with them gone that you’re wise to be taking people in. And the crowd from the Philippines and Syria have turned out to be best kind, so you hope they will stick around to have their own families, the next generation of Newfoundlanders and Labradorians. With age comes wisdom, the greatest of which is gratitude for all you have. You finally see that. All along, you were looking for something you already had. 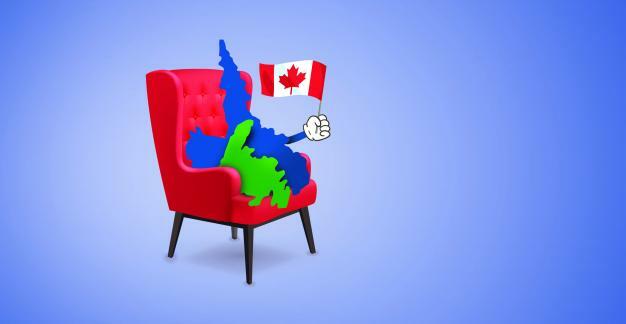 You tried being like other Canadian provinces, you carried on like Florida for a brief interval, but now, at 70, you know who you are and all your blessings. You can stand on a mountain up north, black spruce in an eternity of white, and hear not a sound, nothing, pure silence. You know the bliss of a boil-up in the country after a day picking berries. Another day you’re up early to go out for a few fish and the sun is rising over the water of the bay and you can smell the sea. Until you’ve seen enough of them, you don’t realize that every dawn breaks anew, that every sunrise is unique. You are 70 and there’s nothing you want. You realize you have it all. A writer for the page, stage and screen Edward Riche was born in Botwood, on the beautiful Bay of Exploits. He now resides in Happy Valley-Goose Bay. Steve Hicks is a car guy. He's also a hippie at heart. And he's always dreamed of cruising the back roads of North America with his wife Mary. Six years ago, he bought a 1973 VW Westfalia with plans to fix it up and deck it out for the road trip of a lifetime. But then a health scare brought that to a screeching halt. Just as he started the restoration project, Steve was diagnosed with cancer. While his trip had to be put on hold, it was never cancelled. Through a series of chemotherapy and surgery, he never lost sight of his dream. In fact, his sickness convinced the couple it was time to slow down in their hectic life and switch their focus from house payments and careers to checking important things off their bucket list. So as soon as he was able in 2012, Steve returned to fixing up the camper and the couple concentrated on saving enough money to take a year off work. 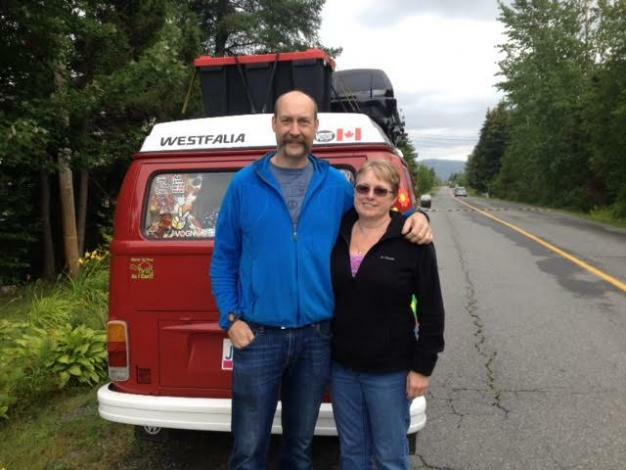 Now at 53, four years since his last treatment, Steve is exploring a backcountry road somewhere with Mary in their red VW Wesfalia embellished with peace signs and flowers. The open road aheadIt was a cold night on September 5, 2015, when Steve and Mary loaded up their VW camper bus, said goodbye to their two grown daughters and their Great Dane Duke, and hit the road. No itinerary, no reservations and no plan other than to cruise into California with the peace, love and free spirits of flower children. As they drove away, they took one last look at the icy Atlantic Ocean and fantasized about soon dipping their toes into the warm Pacific.âPreparing for this trip for three years, you have all kinds of dreams of how awesome it will be. You kind of overlook some of the stuff that actually happens. Like, we never ever dreamt that it would rain. In our dreams it was always sunny skies,â says Steve. But they werenât on the road long before the dreams faded and reality hit - the cold, damp reality of driving across Newfoundland in the September rain, in an old bus with no heat. âWe left at 7 that night and it was cold. It was so cold that Mary and myself, we had a blanket, and as we were driving we were wrapped up in a blanket because thereâs no dash heat. That wasnât part of my dream,â says Steve. Cold and damp with a long road ahead of them, Steve and his wife of almost 30 years snuggled up in the bus as they drove west on the TCH. As the days and weeks stretched out, the Hickses have settled comfortably into a life of no routine. They answer to no one but themselves.âWe just do what we want to do; we donât worry about anything - very stress free - and weâve slowed down to the point that we donât know how weâll go back to work and deal with the daily influx of emails and schedules,â says Steve, an instructor at College of the North Atlantic. âWe get up in the morning and wonder where are we going today? Wherever the road takes us. We are slow travellers, the bus donât go very fast.â The camperâs maximum speed is 90 km/h, so in a typical day Steve drives for about five hours and covers anywhere from 75-200 km, depending on how often they stop. The Hickses' 1973 VW Westfalia on the open road	They may be driving in the slow lane, but the Hickses have covered a lot of ground. They crossed the border into the United States last fall, driving through small villages and farms; taking in the autumn scenery in the New England States. These guys arenât doing the tourist thing. They always take the road less travelled and they donât stay in RV parks. âWe stay in state parks, national forests, anywhere the bus blends in with the environment,â says Steve. They finished the fall season cruising the narrow country roads through the Blue Range Mountains in Virginia, taking time to look in the rear view mirror as the autumn leaves tumbled behind the bus. âWe plan a day at a time, and even our daily plans can change if we see something and we want to stopâ¦â and even when they donât want to stop. Like when the bus broke down while driving through a desolate, run-down town in Oklahoma and they needed a tow. They made friends and repairs, and were cruising again in no time. Through the dry desert Joshua trees and into the tall pines, the Hickses headed west to the California coast, getting nods from fellow flowerchildren along the way. âThe bus is just a magnet for meeting all these people you wouldnât normally talk to,â says Steve. âIn California, where thereâs lots of these buses, everyone was giving us the peace sign.â The hippie-approved travellers cruised along the Pacific Coast Highway, sleeping under the giant Californian redwood trees and reminiscing with other baby boomers about the era of peace and love. Nostalgia at its finest. They eventually dipped their toes in the Pacific Ocean, making it an official coast-to-coast journey. Mary plays her harp among the California redwoods. The couple headed south to Big Sur, a sparsely populated, rugged stretch of the California coast surrounded by mountains and the Pacific Ocean - a dreamer's paradise. âTo be one with Mother Earth was awesome. Mary took the opportunity to pick a few strings on her harp as the sun peeked through the early morning dew. It was quite moving. It was the first time since Tennessee that we had a forest around us. There are no words to describe the beauty of harp strings being plucked among the redwoods,â described Steve in his travel blog. It was the perfect romantic setting for the two lovebirds to take some time to connect with nature. Speaking of romance...by now youâre probably wondering how this husband and wife travel team have managed spending 24 hours a day, seven days a week together for a year. Steve says the couple hasnât lost sight of each other, even for a second. âWeâve grown closer. Weâve been married for 28 years. Weâve always done stuff together. Maryâs been my best friend from day one. My soul mate, I guess.â He says he wouldnât dream of making any journey without her. Steve and Mary, soul mates married for 28 years, in San Francisco	After more than five months on the move, the Hickses took a break and vacationed in Mexico. They headed north back into Canada this spring. Now, theyâre making their way east and plan to be back home in Newfoundland sometime in the coming weeks. Itâs been a winding road with plenty of unexpected twists, but Steve has his health and the love of his life, and heâs gaining new perspectives along the way. - By Amy Stoodley	Follow Steveâs travel blog to see more of what he and Mary have been up to. By Marilyn Sveinson (nee Pike) There existed across the Humber River, not far from Corner Brook, a wonderful, idyllic cabin known to all the family as "Uncle Norman's Cabin." To get there was no small feat, as it was on the opposite side of the river. So with one small boat, my uncle would get everyone safely over (all eight of us cousins) and then retrieve the supplies for the holiday. So many trips later, and in the dark with only a flashlight, he would complete his mission. My aunt would accompany him and her job was to watch for dead heads (sunken logs) that could wreck the motor. The cabin sat beside the river, backed by a large hayfield and surrounded by trees, including a gigantic apple tree. We believed that to be somewhat sacred, as we were forbidden to touch the apples. However, when no adults were watching...who'd miss a few? A stone's throw from the cabin was a small, magnificent, white sandy beach to rival any in Hawaii - as far as we were concerned, anyway. We spent hours building sand castles, bridges and roads while our parents sat and enjoyed the warm sun and kept careful watch "over their flock." Every few days, a couple of us older cousins and my uncle boarded the boat and headed down the river at top speed (7 H.P.) to the dairy farm where we obtained our milk and butter supplies. The cabin had no electricity, so those and other perishables were kept on ice obtained from a shed containing large blocks of river ice insulated by sawdust. There was never a shortage of things to keep us amused at the cabin. On a clear night, we all sat outside on the steps in the dark and shone flashlights on the dozens of bats flying among the trees overhead. When the weather was inclement, we sat around the fireplace and in the light of the lamp we sang or played our favourite game, "I Spy With My Little Eye." A couple of my cousins were obsessed (and still are!) with fishing and spent many hours on the wharf or in the boat catching mouth-watering trout. How we loved haying time! The hay was cut with scythes and piled up in large mountains, and playing and climbing on them kept us entertained for days. (Those poor guys who stacked that hay!) I never did meet the legendary Uncle Norman, but I often wonder if he ever knew what a memorable saga his old log cabin created for all of us. 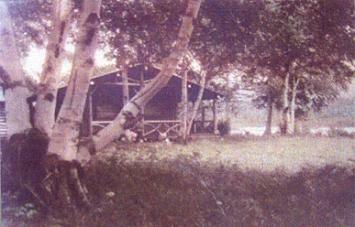 Here is the only known picture of Uncle Norman's cabin, which was taken down years ago. Edna Breen and her daughters share stories of growing up in an historic, and world-famous, section of Ferryland.Story and photo by Dennis FlynnThe two-storey houses and vehicles look like the discarded toys of children in comparison to the enormous mountain of ice looming over on the narrow neck of land. Itâs a scene so startling that it garnered international attention, and photographers from all over the world flocked to Ferryland, NL in April 2017, to see it through their own lenses. Iâm told the iceberg picture even made CNNâs list of top news photos that year. I was among the many Newfoundlanders who made the pilgrimage for a picture and wondered, in particular, about who lived in the older, neatly kept, beige, biscuit-box style house in the foreground that anchored the shot. More than a year later, I am invited inside that very house by the owner.On a cold weekend in December 2018, Iâm enjoying a warm, friendly conversation over piping hot cups of tea with the charming Edna Breen, age 83, owner of the stalwart house and the last remaining full-time resident of the historic section of Ferryland harbour known as the Pool.Her daughter, Tanya Murphy, shows me a beautiful painting she has done of the famous iceberg scene. She points to the dwelling we are sitting in and says with a smile, âIn the spring of 1918, my great uncle, Dave Sullivan, and his wife, Mary Ignatius Barnable, built their house in the Pool, Ferryland. When his wife died, and finding it very lonely with no kids, he asked his nephew and his wife (my mother and father) to move in with him. That was 58 years ago. My parents raised seven kids here and in the 1935 census, the house was valued at $1,000. 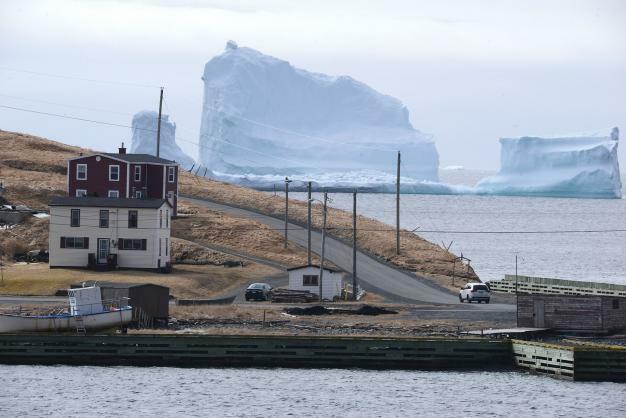 Today with the iceberg fame, itâs priceless.âThe Pool is an area of Ferryland that is almost completely surrounded by water, with very little natural protection from the wind, not even a tree, Tanya says. It is at the heart of where Lord Baltimoreâs 1621 Colony of Avalon was founded. It certainly matches the description of his colony being a stoneâs throw from water to water. Tanya and her sister, Trina Power, describe it as an amazing place to grow up, with everything as their playground, including the beaches, meadows, boats and stages. They even had the Ferryland lighthouse tower to explore. Neighbours all watched out for each other in those days, and the entire Pool area was open and accessible to the 30-40 children who lived in the half dozen or so houses that once occupied what is now an archeological dig site.Still, it takes a hardy breed of livyer to stay in the Pool in the winters. Trina says, âWe used to get lots more snow and it would block the road to our house for days at a time, but now we donât get enough down here to build a snowman.âTanya recalls that during blasts of high winds, theyâd have to make their beds on the floor of the living room as a precaution since, she says with a laugh, âWe all thought that the roof was sure to come off. The road to the Pool is on an isthmus and in stormy weather, there was sure to be a washout. I remember several times on my way to school, waiting for the waves to go out, and then running the living daylights across the isthmus before the next wave came in.â That makes rushing across a crosswalk in a big city to beat oncoming traffic seem positively passÃ© by comparison. Her mother Edna mentions that while the iceberg attracted tons of interest in 2017, sheâs been seeing visitors from around the world since the 1960s. Thatâs when archaeologists from Memorial University first came out and dug test pits on the family lawn and found lots of artifacts related to the Colony of Avalon, including a large iron key.In the 1990s, Edna herself made an historic discovery. While she was at the waterâs edge watching divers (one of whom was her son) working on uncovering a shipwreck, she discovered a very old coin. Edna did the honorable thing and turned it over to archaeologists, who cleaned it up and identified it as an English coin dated c. 1700. The coin is now in the collection of the nearby Colony of Avalon museum.Edna notes that her husband, who passed away in 2009, was always inviting tourists into the house, whether it was to take a shower or have Sunday dinner. He was a heavy equipment operator who also served as an informal lighthouse keeper in the 1970s and 1980s. That genuine hospitality continues in the Breen home. Just last September, a couple from Switzerland dropped by unannounced with a copy of the front page of their newspaper from 2017, with the house and the iceberg on it. Edna invited them in for tea. Before the couple left, they invited Edna and her family to stay with them if they ever wanted to see Switzerland.One visitor that Edna did not invite inside was a polar bear that showed up at the Pool in March 1987. It arrived on the southward drifting pack ice and was wandering around outside Ednaâs house. Not realizing how dangerous this animal was, about a half hour later, Edna and others were walking along the beach, watching the polar bear skip ice pans on its way out to sea. For days after, the Pool was filled with spectators eager to get a glimpse of the bear.The likable Edna routinely gets mail from all over the world from tourists sheâs met. One lady, an artist from Ontario, gave Edna a framed sketch of her grandmotherâs house in nearby Aquaforte, the community where Edna grew up. Looking through cherished photo albums and a wall of mementoes, Edna pauses at her wedding photo taken in Aquaforte. She says, âYou know I still have that outfit.âKnowing the trim Edna is very active as a walker and in her church choir, and she danced the Lancers for years with a local traditional dance group, I gently tease her, âCan you still fit in your wedding outfit?âEdna replies instantly with a wry grin, âIndeed I can.âWhen the laughter subsides, Edna shows me an image of the former schoolhouse in Aquaforte. Ednaâs mother died at a young age, so Edna helped raise her younger siblings and helped tend her fatherâs shop. Even with the grownup responsibilities, Edna has fond memories of her school days. âIt is gone now, but served many purposes as a tiny school, and a small concert hall, and a place dances were held. We had great times there, and I remember the old pot-bellied stove and us having lunches around it during breaks, and the teacher mixing up the Coco Malt drink and giving it to us all. One of the other students was Georgie, and he was a relative of mine and quite a likeable character. Whenever Georgie decided we needed what he called a âholidayâ from school, he would sneak out and shove an old coat or a blanket or something in the funnels somewhere of the stove, just long enough to fill the place with backed-up wood smoke, and then haul it out before the teacher caught on what the problem was. Of course, you couldnât stay in there then and teacher would have no choice but to shut it down for the afternoon. We got a good many âholidaysâ that way,â Edna recalls.So it went, trading tales and memories for a pleasant few hours with Edna and her daughters. Should you be among the thousands of visitors who pass by Ednaâs house in the summer on the Colony of Avalon walking tours, make time to stop and gaze out at the islands and the Pool. Take a rest or just grab a picture at the famous âGossip Bench,â which Edna painted up and places out seasonally in front of her home for the tourists. There is also a âLiarâs Bench,â but she confides with a grin that she much prefers the gossips over the liars. Gossip is more about a little fun, no harm meant, and better stories, she says.Stories are something in great supply in this little house in the Pool.